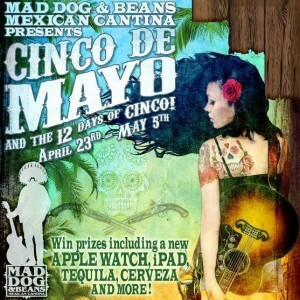 Leading up to Cinco de Mayo, Mad Dog & Beans Mexican Cantina is celebrating by featuring premium tequilas and Mexican beer each day, culminating in the big day, May 5. They have partnered with their favorite brands to bring customers special deals, freebies and the chance to win fabulous prizes (including the new Apple Watch). Sample some of Patron’s finest tequila served up by the lovely Patron models. Featured in the signature Mad Dog Margarita. The finest in organic tequila and hand-made mescal. Patron is back, this time giving away a Calloway Golf Bag. Try the famous Pinche Margaritas.